Kim is a beautiful Momma friend of ours. Her son Hugo is the same age as our daughter Paisley and they shared a nanny at one time. Kim is one of those people who just extrudes creativity, I bet when she works out, even her sweat droplets hits the ground in aesthetically perfect geometry and form. Kim quit her day job at a large SF ad agency over two years ago after Hugo was born in order to be with him full time. But there’s no containing her overflowing creativity. 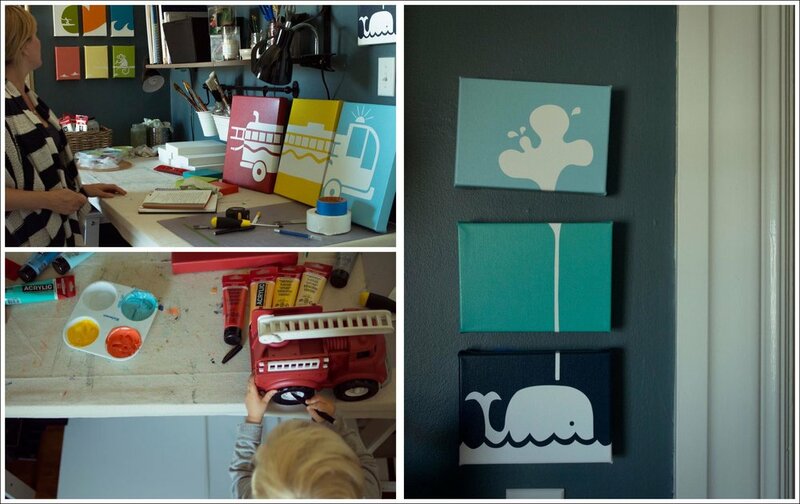 So in between diaper changes and nap schedules she created the company Senn & Sons, painting custom artwork for toddler bedrooms. And with immediate success, started expanding her product offerings to silk-screened and canvas print versions of the same graphically colorful triptychs. And as does a Can-Doer, she agreed to let me photograph her in her home studio with less than 3 weeks to go till her due date! Kim is expecting, surprise, another boy! Thus completing the prophesied Senn and “Sons”. I really enjoyed my time with Senn and Sons. Hugo was the first to greet me, with a big smile and funny questions. (Hugo wanted to make sure I was staying to play for a while, which I was.) He even helped in clicking the shutter to photograph his mommy. Kim’s home is a beautifully sunlit victorian with a great mix of 1900’s trim and detail, and modern touches. Her wonderful aesthetic made the shoot super simple. The space was photo ready. Fueled by homemade cookies, and bow-tie pesto, we were ready to capture some fun images.